The new Dimplex SmartRad sets new standards for both new and retro-fit heating efficiency and represents the cutting-edge in high-efficiency radiator technology. These slimline, stylish, wall-mounted, fan-convector units provide controllable, responsive and super-efficient room heating. They provide a cost-effective alternative or complimentary solution to underfloor heating. Optimised for use with the very latest heat pump technology, the SmartRad range is designed to provide individual temperature controlled room heating at water flow temperatures as low as 35ºC, allowing heat pump efficiency to be maximised. Fan convector radiators are ideal for retro-fit installations in place of conventional radiators or in conjunction with underfloor heating. 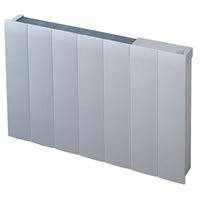 Energy efficient alternative to conventional radiators. Cost effective, practical alternative to underfloor heating. Designed for low water temperature operation. Ultra-smart thermostat for room temperature stability and rapid response. 3-stage fan speed output plus “Eco” mode. Optional plug-in 24 hour or 7 day programmers. Available in 4 different sizes, from 500mm to 910mm wide. Heating Output from 600W to 1800W at 35oC water flow.